Chicken production is a serious business in Nigeria and all over the world. More people are becoming conscious of the need to consume lean rather than red meat for health reasons, and it is projected that the consumption will increase as the world population moves upward. The annual consumption of chickens in Nigeria is conservatively estimated by the Poultry Association of Nigeria (PAN) to be 1.5 million tons. In fact, the coordinator of natnuPreneur Broiler Out grower Scheme by natnudO Foods, Mr Gbolade Adewole, once disclosed that only 30 per cent of this annual demand is produced locally. About 70 per cent are imported illegally into the country, for importation of consumable poultry products has been officially banned. With some training, research and resources, women, youths, graduates and retirees have opportunities in broiler rearing for chicken production, processing and sales. This value chain approach to the business is believed to be more sustainable than rearing for live sale, or processing for chickens alone. From day-old-chicks, broilers take a maximum of eight weeks if fed with balanced feed rations intensively. Intensive feeding requires lighting of the pen so the chicks could have access to feeds and water 24 hours. The requirements for starting this business includes, but not limited to, the following. One of the most important but often overlooked aspects of poultry production either in broiler or egg production is training. A course of training in poultry production is a wise investment that would prevent against losses and equip the farmer with basic knowledge that would help the business. Poultry production is a knowledge-driven sector, and this underscores the importance of training, self-development and consultations on management of chicks from hatchlings to the table sizes; vaccination and medication; disease prevention, identification, and treatment. Entrepreneurial and marketing aspects also require training. There are many government-facilitated and subsidized one or two-week courses of training in some federal colleges of agriculture, institutes and colleges of animal production. Training can also be done at most of the reputable poultry companies in the country. Raising broilers can be done commercially in a backyard space of about half a plot of land. Broilers are raised in an enclosed place called brooding house from day-old to about two weeks, and the temperature is made warm by using electric bulbs, gas or charcoal burners. Heaters can also be installed to keep the temperature warm. After 10-15 days, the birds are placed in the growing pen with normal temperature. So the pen should be divided into brooding and growing sections. After three weeks, some farmers prefer putting the birds into cages until they reach table sizes. The cage system helps broiler to grow faster and avoid contamination or infections associated with deep litter system. 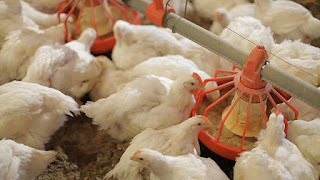 In a deep litter system, which most broiler farmers use at the growing stage, the birds are raised on a concrete floor laid with wood savings and saw dust. The deep litter system can be done at the backyard, for this system reduces the offensive odour associated with the cage system. Andrew Bourne, a broiler specialist at World Technical Support section of Cobb-Vantress, said correct litter and ambient temperatures are vital to ensure chick activity. The specialist added that pre-heating is important and begins at least 24 to 48 hours prior to placement of the chicks, even in tropical countries. “This will ensure the litter temperature is at least 32°C (90°F), with the air and internal structures adequately heated at placement,” said Bourne. Failure to achieve this target, Bourne said, would reduce activities and lower feed consumption, and the bird would lose the opportunity to quadruple day-old chick weight in the first week. “A newly hatched chick cannot control its own body temperature until fully thermo-competent at 14 days old,” Bourne added. Management is a crucial part of broiler production to achieve the desired results. It includes breed selection, preparation before the arrival of chicks, brooding, ventilation, adequate lighting, floor space requirement deep litter or cage management. In Nigeria there are exotic and local breeds of chickens. Exotic breeds are foreign strains that have been adapted and tropicalised, with origins from India and other places. They include Abor Acres and Marshall. Noiler and FUNAAB Alpha are locally developed varieties. Noiler is an admixture of foreign and local genetic resources, while the FUNAAB Alpha is completely indigenous. One of the advantages of the local breeds is their resistance to common poultry diseases, and reduced use of antibiotics. This, in turn, reduces the cost of production and mortality rate. On preparation before the arrival of the chicks to the brooder, Taofeek Olayiwola, a medium scale poultry producer in Osogbo, Osun State, said the first step is about bio-security. He advises farmers should spray the litter and the entire poultry house with sanitisers, remove dirt and wash the equipment, clean water pipelines and fumigate the poultry house with suitable agents if the pen had been used earlier. These steps would, Olayiwola insisted, keep diseases to a minimum. He also affirmed that brooding (heating up the room temperature) should start 24 hours before the arrival of the chicks. The pen should also be designed for good cross ventilation, as excessive thermal heat after the age of two weeks would have negative effects on the growth rate of the birds. Similarly, there must be continuous lighting from day old till marketing. This would give the chicks the access to feeds and water incessantly. Space requirement per broiler bird is one square foot per bird. For example, a floor measuring 50 feet x 50 feet would accommodate 2,500 birds at maturity (six to eight weeks old). Calculating and making adequate space provision for grown up birds are good management practices. Feeds, which take the highest percentage of the cost of production, should be sourced from reliable sources where bio-security are emphasized. The feeds should contain carbohydrates, protein, fats, minerals and vitamins in right proportions. Broilers’ feeds are categorized into three stages. They are pre-starter, starter and finisher feeds, with different nutritional formulations. Day-old chicks to age 10 days are given pre-starter feeds; chicks are given starter feeds from day 11 to 21 and from 21 days old to table size, chicks are fed with finisher feeds. At the day-old, each bird consumes 20 grammes of feeds, and the feed consumption of each bird increases daily by two grammes. At six weeks old, each bird would have consumed four kilogrammes of feeds from a day old. A kilogramme of feed is about N140. Depending on the cost of the bird, the total average cost hovers around N900. Each bird could produce a minimum of two kilogrammes. As the penultimate step chicken production value chain, processing requires some basic equipment. They include slaughter machine, steaming machine and cutting table/tools. There are complete automated chicken processing machines, but these might not be necessary for a beginner. In fact, the small-scale processing could be done manually at the start of the business and the basic semi-automated machines, such as de-feathering, slaughtering and boiling/steaming machines could later be added for production efficiency. The last step in the broiler value chain to reach the end users is getting an outlet, which could be a branded shop, kiosk or store in a strategic location. Paraphernalia needed in the outlet include freezers, scales, packaging materials and stable sources of power for the freezers. Also, reliable power supply is cardinal to this business. Alternative power sources, such as solar power gadgets, are now affordably available, more reliable and more cost-effective than using power generating sets in the long run. Farmers could also supply chickens to eateries, hotels, school hostels, and offices.